As is often the case with iOS arcade/puzzle games, the story isn’t super important to the game. However, the short cutscene at the beginning that explains why you (as Death) are putting these deadlings through their paces is quite enjoyable, as are subsequent cutscenes that play at the end of each phase. Deadlings looks great. Death and the deadlings have great faces and animation, the cutscenes are very well done, and there are crazy amounts of blood when you accidentally hit a saw, spikes, or a laser. Saws even get more bloody if they’ve killed a deadling, which is a nice detail. Despite how bloody death is, it’s always kind of funny; I don’t know what it says about me, but I laughed when I accidentally launched a zombie into some spikes and he’d get stuck there. The only slightly negative things are the monotonous color scheme due to the game being set within blueprints and sometimes jumping into a seemingly-safe wall and dying for no reason. The latter circumstance was rare, but if those walls had spikes or some other indication of danger, it would be better. The in-game music has a varied soundtrack, and a lot of the songs are quite catchy (especially the track on the level-picking). Some tracks have a science fiction feel and some have a I never got annoyed listening to any of the music. Sound effects sound great as well, with each of the zombies making their own distinct noise and hazards sounding like they should. 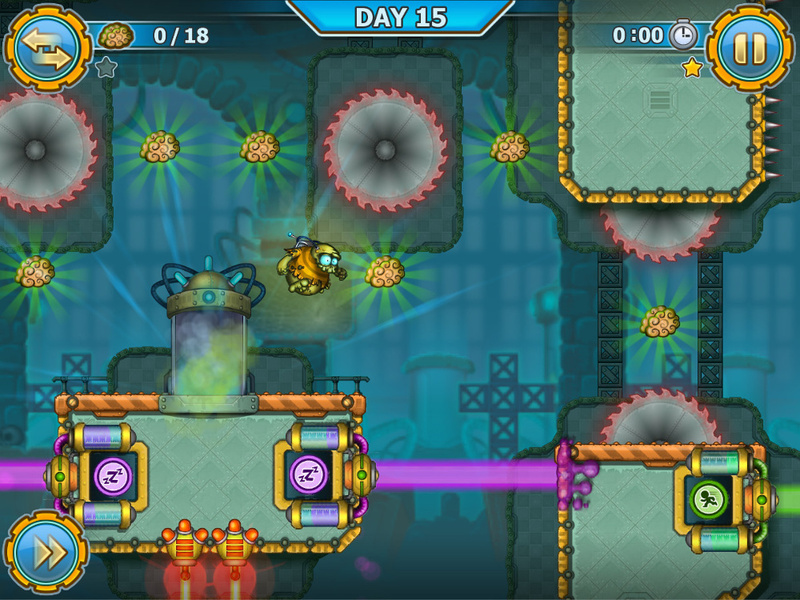 First, you pick your level from the blueprint map; there will be 100 levels to play through in phases of 15 each. 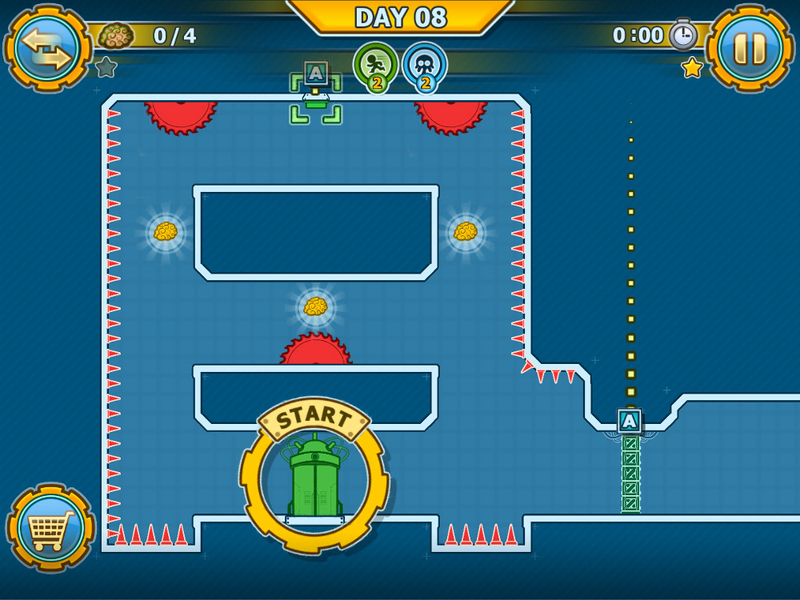 Each level allows you to earn up to three stars (much like Angry Birds). You earn stars based on time, getting to the end of the level, and how many brains you eat. You’re able to replay levels to up your star count if you don’t get all three the first time. If you’re having a problem with a level, you can pay to skip it. 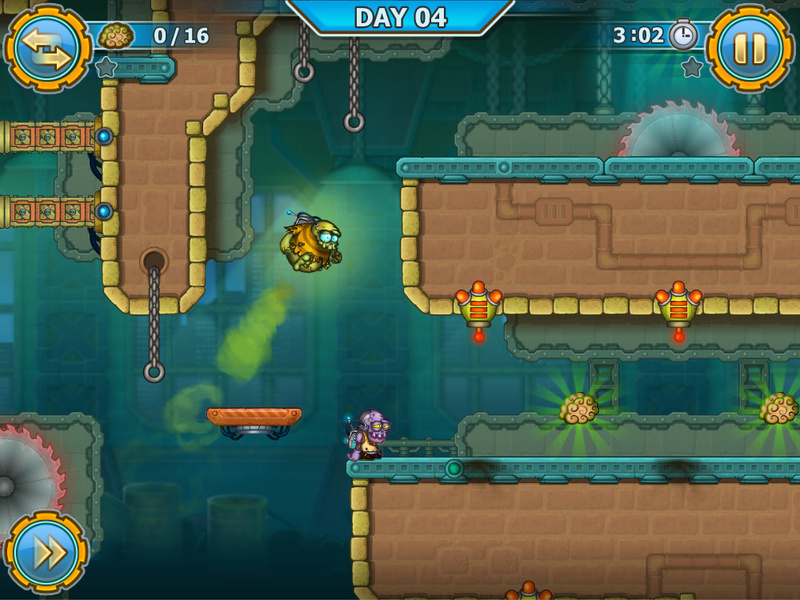 There are two phases to playing levels: the strategy part and the arcade part. Strategy is first; when you select a level, all action is paused until you release a deadling. The strategy stage is when you can assess the level and your challenges, think about which of the five types of zombies you want to use, and remove hazards (if you have enough money in the form of skulls). The arcade stage is when you send your deadlings through the obstacle course and get them to the exit, trying not to kill them too much because you only have so many to work with per level. If you do run out, you can resurrect them and put them in a safe place (again, if you have enough skulls). You can also buy more if you run out. 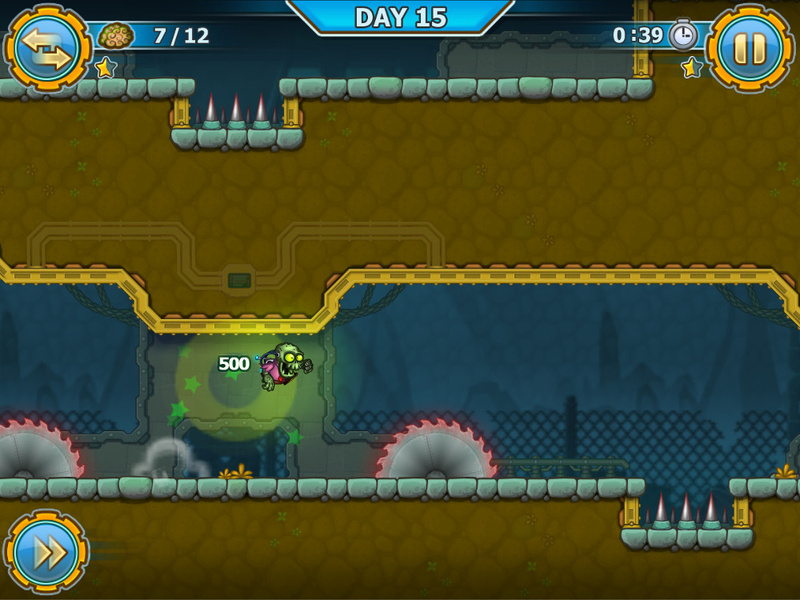 Levels get more challenging as you go on, with more and more ways to kill your little deadlings. I enjoyed the challenge though, and if a saw keeps thwarting you, you can always pay to have it removed, which I think is pretty cool. When you get a new type of zombie, the level that introduces that zombie is easy so you can get used to how they work. I won’t spoil the surprise of unlocking new ones for you, but I really enjoyed playing with all of them, and they’re quite varied in their appearance and playstyle. One more note – if you like puns, you’ll be quite pleased with this game. Deadlings is an addicting, charming arcade puzzler that I found difficult to put down. I definitely recommend that you check it out upon release! Note: The preview build provided to me removed the in-app purchases; I am unsure how their integration will affect gameplay balance (and fun), so that is not reflected in this review. You earn skulls based on the stars you get at the end of the level, up to three per level. Cost of resurrection is five skulls, cost of removing an obstacle is five skulls, and buying more deadlings is one skull per deadling. This might become cumbersome, and you can’t replay levels that you have three stars on so you can get more skulls. Deadlings will be available for iOS, Android, and Windows Phone. Like the game on Facebook here, visit the Artifex Mundi site here, and follow the team on Twitter and Facebook. Follow Nimbi Studios on Facebook, Twitter, and their official site.